The jQuery library includes various methods to traverse DOM elements in a DOM hierarchy. The following table lists jQuery methods for traversing DOM elements. each() Iterate over specified elements and execute specified call back function for each element. find() Get all the specified child elements of each specified element(s). first() Get the first occurrence of the specified element. next() Get the immediately following sibling of the specified element. parent() Get the parent of the specified element(s). prev() Get the immediately preceding sibling of the specified element. 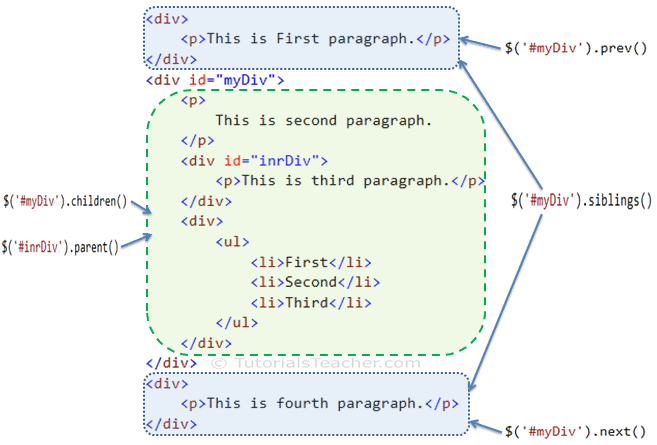 The following figure shows how the jQuery traversing methods get DOM elements. Let's look at some of the important jQuery traversing methods. The jQuery each() method iterates over each specified element (specified using selector) and executes callback function for each element. To begin, specify a selector to get the reference of elements and call each() method with callback function, which will be executed for each element. Index:0, text: This is first paragraph. Index:1, text: This is second paragraph. Index:2, text: This is third paragraph. Index:3, text: This is fourth paragraph. The jQuery children() method get the child element of each element specified using selector expression. Elements returned from children() method can be iterated using each() method. First, specify a selector to get the reference of an element(s) and call children() method to get all the child elements. The jQuery find() method returns all the matching child elements of specified element(s). Specify a selector to get the reference of an element(s) whose child elements you want to find and then call find() method with selector expression to get all the matching child elements. You can iterate child elements using each method. Index:0, text: This is second paragraph. Index:1, text: This is third paragraph. The jQuery next() method gets the immediately following sibling of the specified element. Specify a selector to get the reference of an element of which you want to get next element and then call next() method. The jQuery parent() method gets the immediate parent element of the specified element. Specify a selector to get the reference of an element of which you want to get the parent element and then call parent() method. The jQuery siblings()method gets all siblings of the specified DOM element(s). Specify a selector to get the reference of an element of which you want to get the siblings and call siblings() method. Tips: you can iterate sibling elements using each() method. Visit Traversing methods reference to know all the traversing DOM methods. The jQuery traversing methods allow you to iterate DOM elements in a DOM hierarchy. Use the selector to get the reference of an element(s) and then call jQuery traversing methods to edit it. Important DOM manipulation methods: each(), children(), find(), first(), parent(), next(), previous(), siblings() etc.